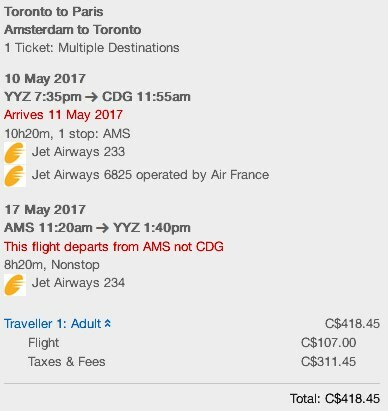 Jet Airways is showing some great open jaw prices on flights from Toronto to Paris, returning from Amsterdam for $424 CAD roundtrip including taxes. The other interesting aspect to this deal is that dates as far away as late June 2017 are available! The flight has 1 stop on the way there, and is non-stop on the way back. Transportation between Paris and Amsterdam is not included. Or try whatever combination of days of the week you want, and see what comes up. Update 11/1 - These have returned... sort of. They are $62 higher now. $480 CAD roundtrip including taxes. Availability in May and June 2017 only. - Try dates in May and June 2017. Try to focus on Mondays, Tuesdays, Wednesdays, and Sundays. toronto, yyz, flight deals, europe, western europe, netherlands, central europe, paris, france, cdg, amsterdam, ams and jet airways. 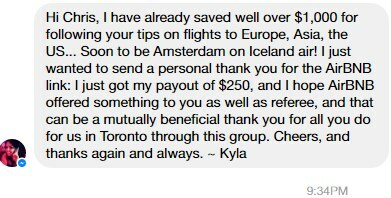 12 Responses to "Toronto to Paris, and then return from Amsterdam - $418 CAD roundtrip including taxes"
This is a great deal. About 3 years ago I flew into Paris, then took a high speed train to Amsterdam and then flew back from there. Both great cities, and the Schipol is a great airport to fly out of. Update @ 11 AM EST - It's still alive. Some dates are higher now. Thank you so much!! We booked it!! So excited!!!! Excellent, have a great time! This is awesome! We booked it! Can't wait! You are amazing chris, booked for May for $418!!! Hello guys, I noticed this too late, I am not seeing this deal being offered anymore, whoever bought it last, can you post a link? My mom and I really want to go. Appreciate your time.